How to charge autoambulator without charger? 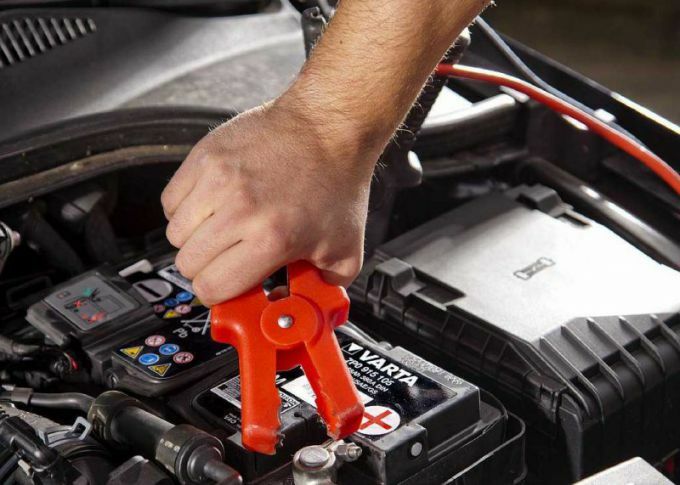 If the car battery is dead and charger is not around, don't despair, it's not a reason to panic. 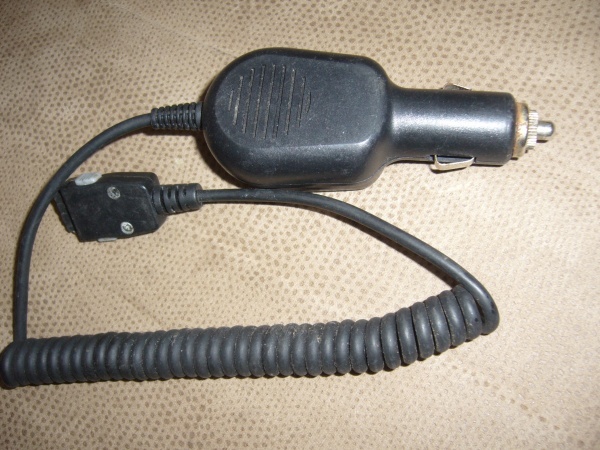 Using parts from the old black and white TV, you can make your own hands a great charger for the car battery. The transformer TS-180-2, wire size 2.5 mm2, four diode Д242А, network plug, a soldering iron, solder, fuses 0.5 A and 10A. Take the TS-180-2 (power transformer from black-and-white TV). It has two secondary windings, which are designed for a voltage of 6.4 V and a current of 4.7 A, connect them in series, thus obtained output voltage is equal to 12.8 V. It is enough to charge the battery. On the transformer, connect the wire cross-section 2.5 mm2 pins 9 and 9` and the terminals 10 and 10`, wire cross-section 2.5 mm2 solder a diode bridge which consists of four diodes Д242А, fit and others that are designed for a current of 10 A. Install diodes on the big heat sinks. The diode bridge assemble on glass fibre laminate wafer of the desired size. Connect the primary winding of the transformer in series, place a jumper between terminals 1 and 1` , to the terminals 2 and 2` and solder the cord with plug for 220 V. In the primary and secondary circuits replace fuses, respectively – 0.5 A and 10 A.
Unplug the charger. Reconnect the battery. The voltage at the battery terminals during charging should not be more than 14.5 V. To control the current and voltage, connect a charger ammeter with a scale dimension of not less than 10 A, and a voltmeter with a scale dimension of not less than 15 V. Also, it is possible to control with a multimeter, which limit the measuring current should be at least 10 A. Limit the charging current by including in series in the gap "minus" wire 12 Into the light output of 21-60 W.
It is impossible to test the device "on a spark". It is impossible to connect to confuse "+" with "-". Follow fire safety rules. Do not leave the appliance unattended. Definitely obestochivaete device when connected to a battery. The heart of the car is the engine. With that, I'll take all the drivers. But in order to start this heart and then monitor his work, feeding all kinds of sensors and devices, there is a rechargeable battery. Why this name? Because it retains and accumulates the electric current and consists of several batteries assembled in a battery. While a car battery is charged, problems with engine start no. 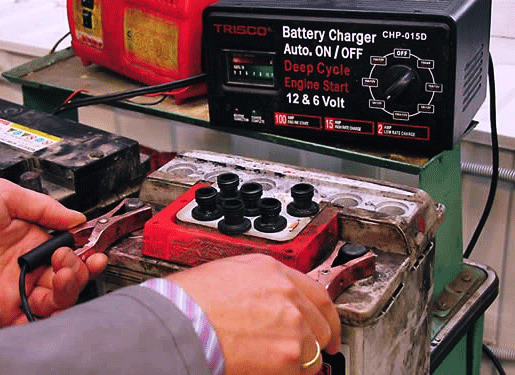 For vehicle operation are often used acid batteries, i.e. those in which the electrolyte is a sulfuric acid solution in distilled water. Therefore, the technical condition of the battery can be monitored with a hydrometer. It allows you to determine the density of the electrolyte. If it is high - the battery is charged, low – low. For this purpose you can use the load plug, which shows the voltage of the entire battery or each individual "banks". According to her testimony, you can determine the battery is charged or not, and how stable the voltage. As soon as it becomes clear that the battery requires recharging, the question arises: "How to do it?" Currently, to purchase the charging device in the store no problem, but if you accidentally on a shelf in the garage gathering dust and AC transformer, step-down the voltage from 220V to 16V, then the issue can be resolved without the store. • light bulb included in the circuit of the secondary winding. Once in the secondary winding of the transformer voltage appears, she lights up. Rectifier device do themselves, gathering of the diode rectifier bridge. All the device mount onto a base made of a dielectric material (textolite, plywood, non-melting non-conductive plastic). Based on secure the transformer. From the same material assemble building, which make a lot of holes for cooling of the transformer and rectifier device. On the front wall of the housing fasten the control lamp of inclusion, switch, ammeter, rheostat. Output wires from the rectifier device preferably equipped with terminals of different diameter so that when the connection to the battery do not reverse the polarity. Checking compliance with these mandatory conditions, plug the charger into the network, connect the terminals to the battery and rheostat install the required charging current. The value of a control on readings of the ammeter. In the room where charging the battery, be sure to provide good ventilation. In the process of charging the electrolyte produces hydrogen and its accumulation, even from a spark, may burst. During the operation of charging the battery be sure to remove the batteries drain holes. Otherwise allocated when charging gas can accumulate under the battery cover, resulting in a possible fit of the case. Motorists spend a huge portion of your time behind the wheel. Very often it happens that the road runs down a mobile phone. It is therefore useful to have a car charging device from the cigarette lighter. But the original car charger , the device costs a lot of money. And why spend money on something that you can do with your hands? In every home very often lying spoiled charger for mobile phone from the network. You will need one spoiled the charging device, but rather just a plug for a phone. Also need the part that plugged into the cigarette lighter. It can take from the old car charger or to buy in the store. Choose only the folding part that it consisted of two parts. Disposable will not work, as you will need to disassemble to solder the wires. Now carefully cut the plug from the mains charging. Cable length select it to be comfortable to connect the phone to charge. If you want to make a wire coiled in the form of a spring, you have to increase the length of the wire two to three times. Take the plug that plugs into the cigarette lighter and disassemble it. It usually consists of two parts, which are attached to each other or to the plastic clips or small screws. Inside you should see a resistor that converts the voltage of 12 V, which is powered by your phone. Remember that the resistor should match the current consumption of your mobile phone, otherwise you risk to burn the phone. Also, the plug should be a fuse. If the plug is old, check. to the fuse was working. Now we need to unsolder the old plug and wire. In any case, do not tear it off as you may break the terminals. Strip the wire from the plug for the phone. For this you need to remove the top thick layer of the rubber coating, then you will see two wires of different colors. They should also be clean. Don't clean too much wire, then bare wire is not sticking out of cigarette lighter plug. Now carefully solder the cleaned wire to the terminals, observing polarity. Find plus and minus can be experienced by using a special screwdriver tester by inserting the cigarette lighter plug. Now assemble the plug back in. Thoroughly test its strength, he broke the cigarette lighter. To make the wire twisted, tightly wind it on a pencil or pen and leave in this position for some time, preferably overnight. Then remove it and you will receive a wire spring. You can also decorate the plug on your taste. Carefully assemble and disassemble the cigarette lighter plug. Carefully follow the place of soldering. Be sure to check the operability of the fuse. Batteries size AA are among the most common. They may have a capacity from 450 to 2500 milliampere-hours. Such batteries represent an advantageous alternative to the conventional batteries of the same size. 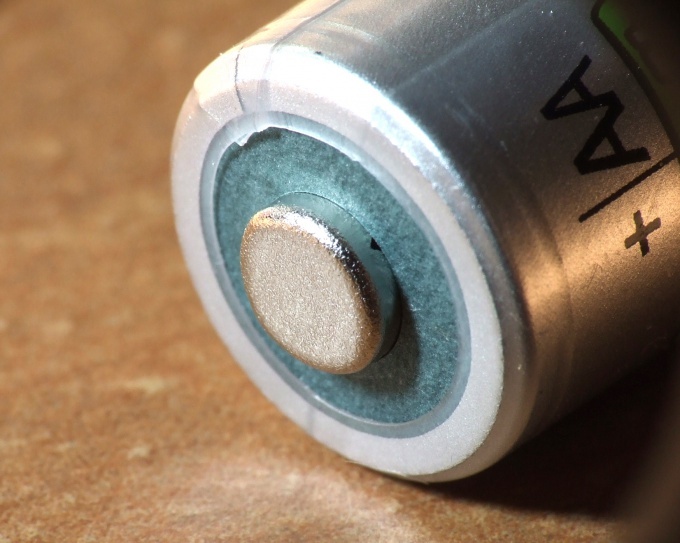 - what batteries are Nickel-cadmium or Nickel-metal hydride, not any more.Remember that the presence of the word "charge", "recharge" or "rechargeable" does not always says that the device is a battery. They can be part of the revs "not rechargeable", "non-rechargeable", "do not recharge" or similar. All this warnings about that before you battery and that the charge does not have to. Look at the battery capacity symbol. Usually it is expressed in milliampere-hours. Ensure that it is in amp-hours. Divide the resulting number by ten. You will get the rated charge current, expressed in amperes. For example, the capacity of the battery is 1500 mAh, or equivalently, 1.5 Ah. Then the charge current is 0.15 A. To charge the batteries of size AA, it is more rational not in pairs as is usually done, but one at a time. The power source for use with an output voltage equal to 3 V.
Series with each of the rechargeable batteries include a resistor whose value calculate in the following way. Since the voltage of the discharged battery is 1.1 V, and a power source - 3 V, the voltage drop across the resistor at the beginning of charging will be 1.9 V. Divide this value by the charging current, expressed in amperes, you will receive the value of the resistor expressed in ohms. By the end of the charging, as the battery voltage rises, the charge current it will slightly fall. Calculate the minimum wattage of the resistor. To do this, multiply the voltage drop across it to the current charge. If the latter is expressed in amperes, the power obtained in watts. Connect the battery in series with a resistor to the power source in the polarity corresponding to the same indicator of the source. Keep charging for 15 hours.